The EGM Aesthetic Lab’s interactive performance environment combines an infrared motion tracking system (15 Vicon cameras) with sound processing software (SuperCollider). 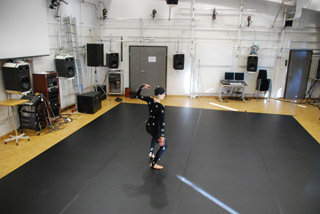 EGM scenarios are designed to address various aspects of bodily movement and spatial awareness, and to form various topologies of sonic response distribution in bodily and surrounding space. 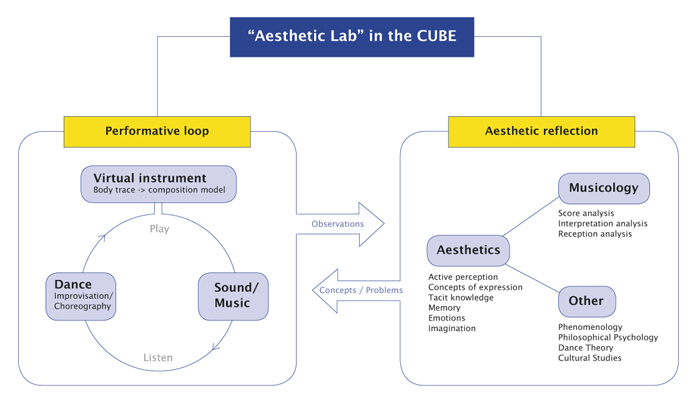 The research method employed in the aesthetic lab included dancers’ explorations (with specific attention goals), combined with analytical group discussions. Several research modes developed around seeking to penetrate the intermedial core experience of the dancers as resulting from their presence in the instrument. The submenu features a closer description of the method, as well as, the technology used. Look here for a closer description of the scenario designs, plus the implemented software composition models.